Two young grey seals have been released back into the sea off Cornwall after five months of medical treatment. The seals, who were rescued as young cubs, both had to be treated for severe wounds and infections. Named Ragwort and Pauline, the seals were nursed back to health by staff at the National Seal Sanctuary in Gweek, near Helston. Scientists have put identification tags of the pair in the hope of tracking their progress. Among those invited to help in the seals' release was actor Brian Blessed who is an animal welfare campaigner. 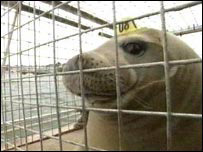 Ragwort and Pauline have been released at a location where other seals have been spotted. When the seals were released they swam around the boat for a while before heading further out to sea. Anyone who spots the seals with their distinctive identification "hats" on their heads is being asked to report the sightings to the National Seal Sanctuary.